Eco warrior Balbir Singh Seechewal, who hogged the global limelight by reviving the almost dead 160-km-long Kali Bein, a rivulet sacred to Sikhism, and developing low-cost community-managed micro-sewage technologies, is now a ray of hope to rejuvenate India's longest river - the Ganga.Every week, village heads settled along the Ganga visit this village near Jalandhar town to understand the sewage technologies and to replicate them in their respective villages.The visits are part of the central government's ambitious Rs.20,000 crore ($3 billion) Clean Ganga project. "We are educating the visiting villagers on how to collect the domestic sewage for simple treatment in open ponds by natural methods and then reuse it for irrigating the fields," 55-year-old Sant Seechewal, as he is better known, told IANS in an interview.Wearing his trademark maroon robes, the only Asian winner of TIME Magazine's Hero of Environment award explained that the cost of setting up the treatment tanks and supplying the treated water to the fields through a pipeline is low compared to the use of electrical water pumps that heavily drain out underground water. Moreover, he said, the treatment techniques that have been adopted by more than 150 villages in Punjab, including 100 located on the Kali Bein, ensures that no polluted water flows into the surface water channels.According to him, a village with a population of 14,000 to 15,000 requires a treatment plant on 27 acres of land.However, for bigger towns and cities this model will not work. They need sewerage treatment plants.Sant Seechewal said 1,657 villages located along the Ganga from Uttarakhand to West Bengal have been shortlisted by the Union Water Resources Ministry for field training.These villages have been discharging their effluents directly into the Ganga.So far, representatives of 375 villages from Uttarakhand, Uttar Pradesh, Bihar and Jharkhand have visited this village.He said some villages in Jharkhand adopted this technology last week.Srikant Tripathi, a visiting village head from arsenic-affected Kanpur district in Uttar Pradesh, told IANS that Seechewal and nearby villages have seen prosperity by adopting low-cost, community-managed waste water treatment tanks.He said Sant Seechewal and his followers explained the model adopted to clean the Kali Bein rivulet and setting up and operating waste water treatment plant. "Even the farmers admitted that there is noticeable increase in the crop yield as treated water boosts crop production," Tripathi added.Fifty-two village heads from Kanpur and Unnao districts were in Seechewal on May 21-22. They blamed the local leather industry for polluting the Ganga. "You cannot clean a river by setting up sewage treatment plants or stopping the inflow of sewage into it. You have to maintain natural conditions in the river like ensuring adequate flow. All rivers or rivulets have a self-cleansing ability," explained Sant Seechewal, whose feat of cleaning the Kali Bein rivulet, once a drain of domestic and industrial pollutants, also attracted global attention.Besides cleaning the rivulet in just two years by deploying over 3,000 local volunteers in July 2000, Sant Seechewal has also played an important role in re-greening its banks by raising medicinal and fruit-bearing orchards.The rivulet's revival has also recharged the local water table as the handpumps had gone dry for the past four decades and are now yielding water, he said, while pointing towards the fields.Former President A.P.J. 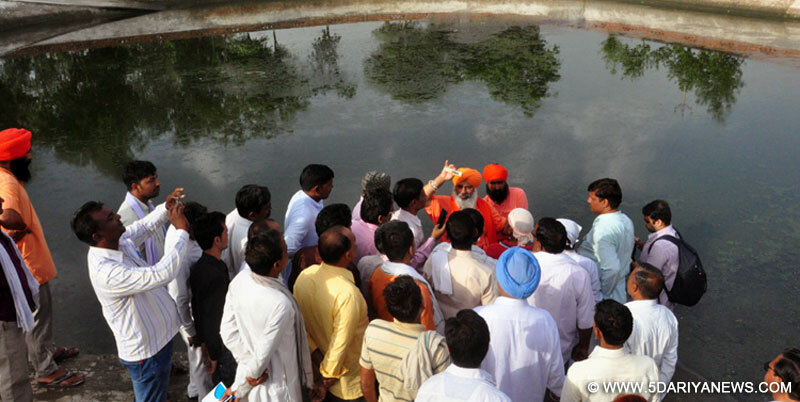 Abdul Kalam visited the village twice in 2006 and 2008 to understand and acknowledge Sant Seechewal's technologies.Delhi Water Minister Kapil Mishra visited Seechewal and Sultanpur Lodhi near here in the last week of May to understand the waste water management system and to seek help for cleaning the highly-polluted Yamuna river.